(above) Sareh Nouri’s asymmetrical pleated top and pickup skirt, $4,998.95, at Mon Amie Bridal Salon in Costa Mesa with Camilla Christine’s cascading veil, $748 at Styled by TC in Tustin. Jim Hjelm’s ivory ball gown is a splendid mass of taupe tulle with a sweep train and beautiful modified sweetheart neckline. The draped bodice features a natural waist accented with a pearl and crystal trim. $2,970, at JLM Boutique in West Hollywood. Add glamorous subtle accents of sparkle with Dvnchi’s silver headpiece glittering in Swarovski crystals, $240, exclusively at R-Mine Bespoke in Studio City, and crystal and mother-of-pearl drop earrings, $575.99, at Mon Amie. Steal the show in Matthew Christopher’s low-back, strapless “Twyla” gown with a layered horsehair skirt and sequin underlay, $4,898.95, from Mon Amie Bridal Salon. Add clustered Swarovski crystal stud earrings by Dvnchi, price upon request, at R-Mine Bespoke. Los Angeles-based Erica Koesler’s five-strand pearl and rhinestone rondelle bracelet with an elaborate rhinestone center and crystal drop enclosure, $490, online at Erica Koesler. Accent tresses with Dvinchi’s silver-dipped hair combs adorned with Swarovski crystals, price upon request, at R-Mine. Bring the bling by stacking Martin Katz’ small-diamond Irena band micro-set with 144 single-cut diamonds, $8,500 each, and a 2-carat Asscher-cut diamond ring set in white gold and micro-set with 182 white diamonds, $39,500, all from Martin Katz in Beverly Hills. Twirl the night away in Hayley Paige’s “Nicoletta,” featuring a floral sequined ballet bodice, curved V-neckline, spaghetti straps that crisscross in back and a full-tiered tulle skirt. Price upon request, from JLM Boutique. Add Erica Koesler’s statement bracelet with square rhinestone medallions and floral centers, $525. Slip into Hayley Paige’s “Keaton,” a striped organza fit-to-flare gown with a sweetheart strapless neckline and ruched, elongated bodice ending in a flounced tulle and organza skirt. Pair Camilla Christine’s “Milla” studs, featuring a cluster of Swarovski pearl and pavé rhinestone beads, $88, at Styled by TC; and Erica Koesler’s five-strand pearl bracelet with rondelle and crystal accents, $270. Dazzle in this garden-inspired Pronovias Atelier gown with a fitted, ruched tulle bodice and fit-and-flare skirt adorned in hand-beaded green flowers, $5,998.95, at Mon Amie. Bring the sparkle with Dvinchi’s silver and Swarovski crystal drop earrings, $190, at R-Mine Bespoke. Brilliant two-carat oval diamond ring micro-set with 86 diamonds (.42-carat total weight), $40,700, at Martin Katz in Beverly Hills. Complete your bridal look with this sweet tulle blusher veil by Erica Koesler, which features a large rhinestone flower and a sprinkling of rhinestones along one side, $240. 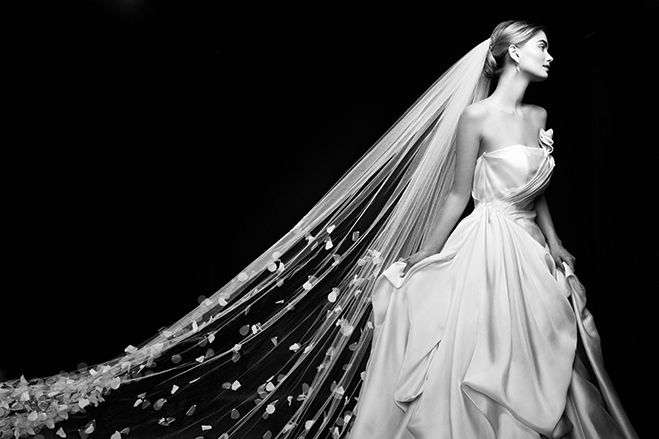 Take a modern walk down the aisle in Vera Wang’s two-tiered organza gown with tulle overlay and Chantilly lace trim, $1,298, White by Vera Wang, from David’s Bridal. Add flair with Camilla Christine’s cut-to-order black silk ribbon sash, $48, at Styled by TC; and Jennifer Leigh’s long tulle veil, $159.95, at Mon Amie. Play up the accessories with layers of cuffs and rings, including (on her right hand) a Shahaka gold-plated ring with faceted crystal stones and citrine gems, $247; a rose-gold-plated “Terra” ring, $145; and sterling silver “Hangman” cuff, $440, all online at Pushmataaha. Her left hand is adorned with a sterling silver geode cuff, $150, online at Charles Albert, and diamond and blue sapphire engagement ring in white gold, $3,299.99, online at Vera Wang Love. Finish the playful look with Rene Caovilla‘s gold leather and crystal heels, price upon request, online at Rene Caovilla. This Hayley Paige draped organza “Eden” blush gown will be one to remember, with soft lace underlay, sheer corset detail and a sweet grosgrain ribbon bow at natural waist, price upon request, from JLM Boutique. Maria Elena’s bold shield earrings encrusted in Swarovski crystals with a light blue Swarovski crystal center, $405.95, at Mon Amie. Erica Koesler’s rhinestone medallion bracelet (details on page 64) and Vera Wang Love’s sparkling diamond and blue sapphire engagement ring in white gold, $3,699.99, are the perfect finale. 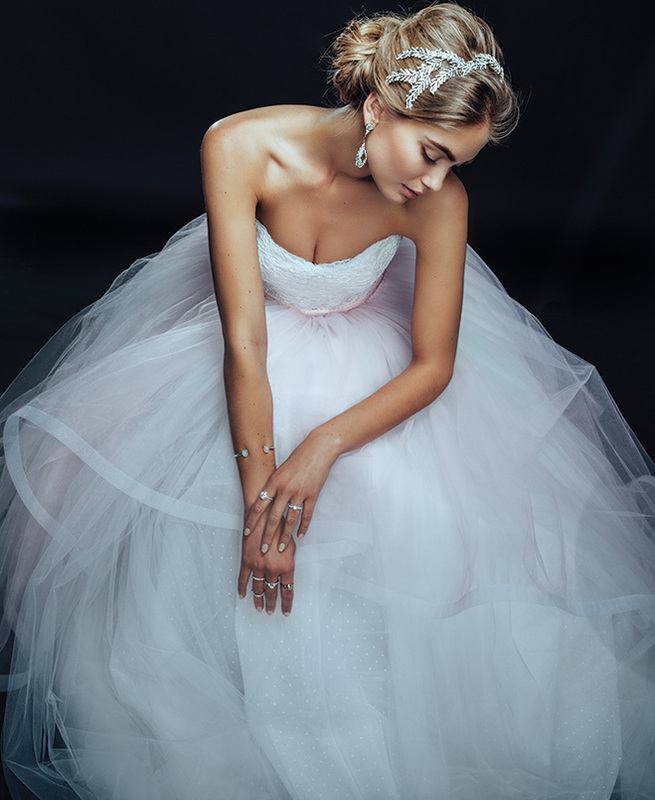 Add a touch of romance with R-Mine Bespoke’s strapless lace ball gown, $3,700, with a pink tulle overlay skirt, $940, and Dvinchi’s beautiful Swarovski crystal headpiece, price upon request, all exclusively from R-Mine Bespoke in Studio City. Layer the look with a sterling silver quartz cuff by Charles Albert, $120, diamond cascading shank engagement ring in 14K white gold, $2,999.99 atverawanglove.com, and a brilliant round diamond ring in white gold, $59,500, by Martin Katz in Beverly Hills. For a memorable finish, Maria Elena’s clear and turquoise Swarovski crystal pendant earrings grace the jawline, $525, at Mon Amie. Mon Amie shares their favorite trending styles from the fashion week runways. Garden weddings are aflutter with heart-melting moments in these romantic avant-garde gowns with a floral flair as photographed by Stephanie Williams of This Modern Romance at Kestrel Park in Santa Ynez.